Accuweigh Port Adelaide branch recently installed eight sets of platform scales for monitoring the growth rates of citrus tree under varying watering conditions at the South Australia Research and Development Institute in Loxton, SA. The A500 platform scales were installed into an environment in which the climate and growing were controlled. Citrus trees were planted into large PVC pots which are then positioned onto the platform scales. The platform scales are fitted with digital weight indicators, and are connected to a data logger which records the weights of the trees at set intervals of approx 10 minutes. 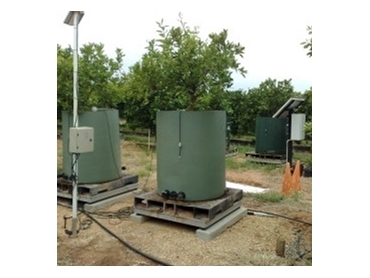 Growth rates of the citrus trees are compared from graphs that are produced by the data loggers. The tree on each platform scale is supplied water at different rates and times of day, so that these results can be monitored. Solar powered generators and localised wind generators power the platform scales, eliminating the need for running lengthy power cables underground. These platform scales feature a fully hot dipped galvanised heavy duty construction, eliminating and diminishing potential corrosion caused by the regular watering processes. SARDI will release the results of the watering profile experiments to citrus growers for use as a guide in utilising their water allocations to maximum potential.